Teenage designer Jeanne-Marie Fraser is cutting her cloth in the fashion industry through developing her own clothing label. The 18-year-old former level three fashion and clothing student, who completed her course at Croydon School of Art on Friday (July 4) but does not yet know what grade she achieved, has been developing her clothing brand called Limitless London over the past year. She designed and created a range of men’s and women’s outfits in the college workshop, including t-shirts, trousers, jackets, cardigans, and coats inspired by contemporary designers Dries van Noten, Vivienne Westwood and Alexander Wang. Designs by Jeanne-Marie, who will start a fashion degree at Edinburgh University in September, were showcased at the college’s end of year fashion show and she has already sold around 30 t-shirts and other outfits making a £150 profit. The Cultural Lounge, a shop in Edinburgh, has also agreed to stock her outfits and she made t-shirts for Edinburgh-based band Indigo Velvet’s recent Hit the Road tour. 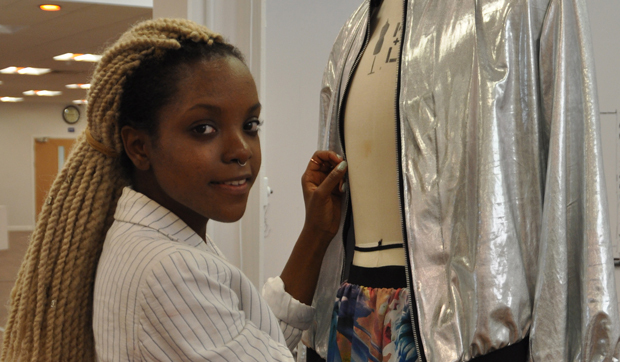 CAP- Fashion student Jeanne-Marie Fraser works on one of her outfits.